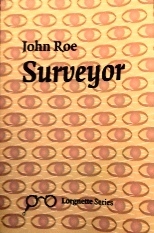 John Roe has chosen a deceptively simple – but actually rather clever – title for his debut collection Surveyor. At one level it denotes a person whose occupation is very hands-on and involves careful measurement and assessment of (literally!) concrete objects. But it can also suggest someone detached and on the edge of things, who has the luxury of being able to reflect more abstractedly on what is going on around him. Roe’s poems are clearly the work of someone who finds himself, at different times, taking on each of these persona. like a raider from a lost ark. ‘Abode’ ventures even further down the scale of deprivation into homelessness. Here Roe unsettles the reader by first using “list” as an unfamiliar invitation and then applying the word to the sea rather than, as is more common, to a ship. Any feeling of disorientation this induces may well be reinforced by the odd inversion of verb and adverb in the last line which draws us into a sense of the precarious position of the poem’s narrator. ‘Heavyweight Job’ is ostensibly a return to consideration of a powerful figure, namely a boxer. But evidently, rather than being a champion, this one resembles the subject of the famous Paul Simon song who fears his career is nearly over. “I sag with fatigue, / facing eye to eye // with a wily old maestro”. ‘Heavyweight Job’ features several more examples of Roe’s slightly off-centre syntax and vocabulary. The line just quoted, for instance, is a strange hybrid of “facing a wily old maestro” and “eye to eye with a wily old maestro”. A couple of lines further on we find the active voice “my muscles paralyse” instead of the more routine passive construction “my muscles are paralysed”. Yet again “I force one last focus” is an interesting compression of the more prosaic “I force one last act of focussing”. I don’t doubt that Roe does this sort of thing deliberately because similar slightly odd phraseology (like an awkward translation from another language) is also to be found elsewhere. ‘My Father’s Last Portrait’ speaks of “the fruit of you” and one is initially inclined to wonder why it does not simply say “your fruit” – until a moment’s reflection shows that the two versions carry interestingly different resonances. In a similar vein is Roe’s occasional use of mildly archaic language – “lucre” for “money” or “jest” for “joke” – in the middle of otherwise conversational passages. Such subtly arresting linguistic tricks persuade me that he is an interesting and original poet as well as a sensitive and observant one. The collection does of course have some weaker aspects – what collection doesn’t? For me, the sestina ‘Surveying’ does nothing with its subject that the opening poem has not already done better; and it feels rather as though an obligatory poetic exercise is being attempted. Some of the shorter poems are promising but disappoint slightly for want of further development (although a notable exception to this criticism is ‘A Church Key’ which seems near perfect in its delicate weighting). Overall, however, this is an accomplished first collection; and it is one which does not reveal all its complexity on first, or even second, reading. It is to be hoped that John Roe will not keep us waiting too long for his first full-length volume.